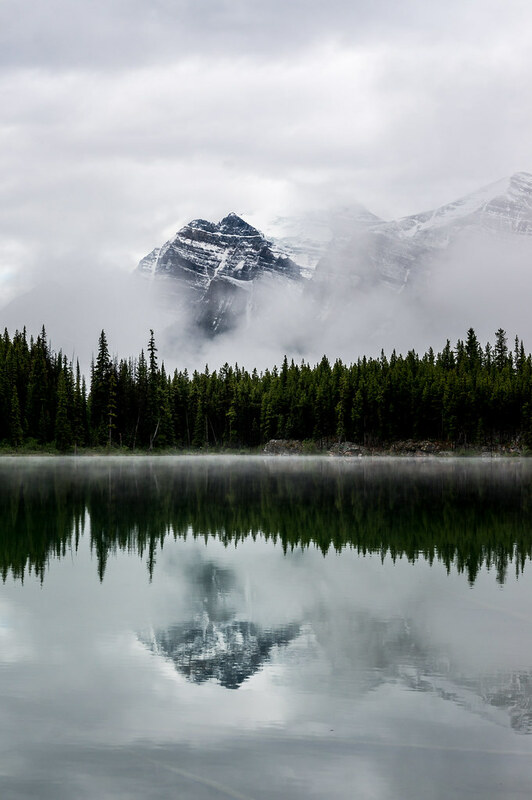 Mystical Herbert Lake On The Icefields Parkway | Flights. Camera. Satisfaction. Thanks Tom, I think I agree about removing “one of the” as well. It’s certainly the most scenic drive I’ve ever done myself. And the view from Big Hill is spectacular, you have a good memory! My pleasure, happy to bring back some fond memories for you! I’ll never forget driving over the Big Hill with a friend who was a geology student at the time. “This is a perfect example of glaciation, ” he exclaimed. Indeed. Haha, I have to say that wasn’t what I was thinking at the time! Truly beautiful. Hope you had the best time. Wow, it certainly looks mystical in your image here…. I was fortunate to drive part of the Klondike Highway in Alaska a few summers ago. I thought THAT was an amazing scenic route but if the rest of your shots look like this one, this drive might top it! I think you’re right, though, that the cloud cover as it was adds to that mysterious quality that surrounds towering, snow-covered, majestic mountains 🙂 Beautiful, Ben. What a wonderful opportunity you had. That sounds fantastic! I’d love to go back and head further north into Yukon and Alaska, even more remote and untouched. What was your favourite part of that trip? I just love the mountains, and the changeable weather makes them all the better (so long as I’m not hiking in the rain). I have to say the Canadian Rockies were much more spectacular than what we have here in Europe. Looks stunning, and look forward to seeing more photos. I spent a week in British Columbia earlier this month and really fell in love with Canada, have got to get back to see more. Thanks Lucy – where did you travel to in BC? We spent a week there, between Whistler, Tofino and Vancouver. We loved it there too, everybody was so genuinely friendly. I think it helped being British, we got a free bus ride out of it! We started in Victoria then travelled up Vancouver Island to Campbell River and on up to Port Hardy and out into the Great Bear Rainforest to go bear-watching, then back to Vancouver. Bit of a whistle-stop trip but a great country. Wow you ventured quite far north on Vancouver Island then, was it worth the trip? I’ve not heard of the Great Bear Rainforest but it sounds pretty cool! Indeed Canada is an amazing place to shoot landscapes… stunning shot. You were right, there is a new picture and it’s fantastic!